This was a crazy trip from the start. Zach and I caught a red eye flight to JFK from San Francisco on Saturday night. Then we bused in to Midtown at 6 AM and were planning our day an hour later hunched over coffee at the McDonalds across from the New Yorker. Things never slowed down from that point. I knew that this was going to be the ultimate Nimble Photographer trip. I had my laptop and Micro Four Thirds kit stashed in my backpack. But from the minute we checked in, until I caught the red eye back home 3 days later, my bag stayed in the room, and it was just Zach and I on the streets of New York. 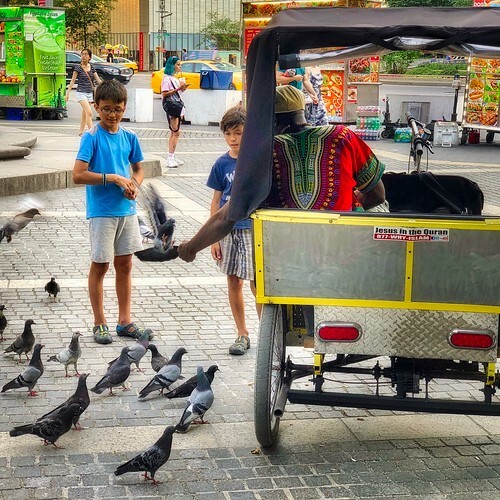 "Kids and Pigeons, Central Park" - iPhone X. Processed in Photos for macOS and Luminar 2018. Photo by Derrick Story. This is precisely the situation that motivated me to spend the extra money for the iPhone X last year. With temperatures hovering around 90 degrees F and high humidity, neither of us wanted to carry a bag of any type. Our kit for the day were shades, wallet, and smartphone. 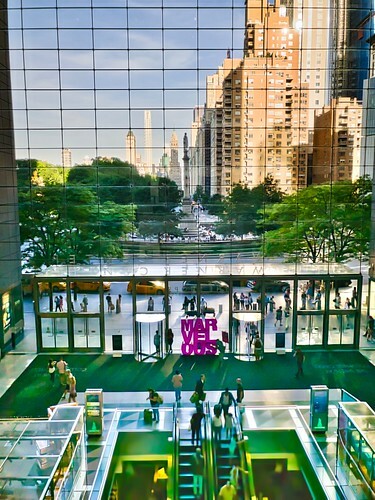 "Columbus Circle, NYC" - iPhone X. Processed in Photos for macOS and Luminar 2018. Photo by Derrick Story. The thing about it was... I was in NYC, one of my favorite places for street photography. So I wanted to be able to capture the world as we maneuvered through it. And the dual-camera iPhone allowed me to do just that. I worked quickly and without drawing attention to myself. 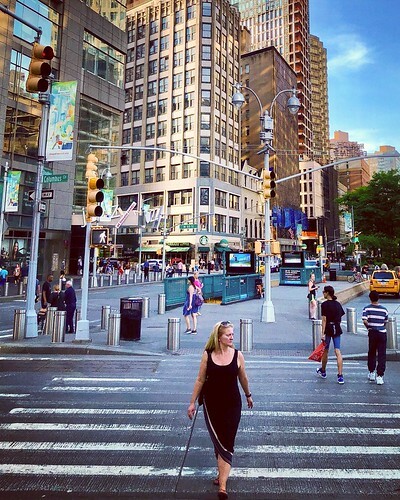 Zach and I kept our pace as we worked through our ToDo list (he's getting settled for a Summer internship with the NBA), while I also recorded images of us, New York City, and the people who make it interesting. "Inside Out, Time Warner Building" - RAW file captured with iPhone X. Processed in Photos for macOS and Luminar 2018. Photo by Derrick Story. I did process most of the images on my laptop once we returned to the hotel. I used Photos for macOS (the images were there waiting for me thanks to iCloud) and Luminar 2018. The changes were saved back to all my devices for sharing on social. I could never be limited to a smartphone for all of my photography. Just like I could not survive with just a Phillips head screwdriver in my toolbox. But for this whirlwind trip to New York, the iPhone allowed my to stay focused on my son, yet come home with many wonderful visual memories. After the second red eye home, I'm a little bleary-eyed today, but very happy. I love the intoxicating scent of lemon blossoms. And I certainly got my fix photographing this beautiful flower with the Olympus Digital ED 30mm f/3.5 Macro lens ($224) on an OM-D E-M1 Mark II. 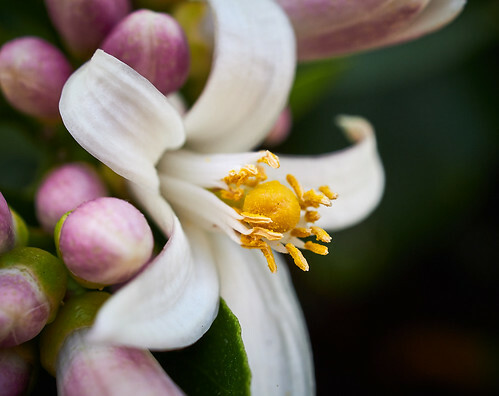 "Lemon Blossom" - Olympus OM-D E-M1 Mark II with 30mm f/3.5 macro lens. ISO 200, f/5.6, 1/50th, handheld. Photo by Derrick Story. In the world of macro lenses, the Olympus 30mm is very compact and quite affordable. I had read good reviews of it. So I thought I would take it for a spin in my patio garden. The reviewers were right. This is a excellent-value optic. On the E-M1 Mark II, the focusing was fast and accurate. There aren't any controls on the lens itself except for a nice manual focusing ring. I didn't need it, but it's nice to know that it's there. Other than the excellent images, what I really like about the lens is that I can have macro capability with me without taking up too much space in the camera bag. And it's very light as well. If you're looking for a compact prime lens that works great for both macro and general purpose photography, I can easily recommend the Olympus Digital ED 30mm f/3.5 Macro lens. Who knows? It could open up a whole new world for you. The Olympus 30mm f/3.5 Macro lens has a high Nimbleosity Rating. What does that mean? You can learn about Nimbleosity and more by visiting TheNimblePhotographer.com. I turn to Luminar when I need to add a little creative magic to my images. But there are a few older Macphun apps that I love as well, specifically Tonality and Noiseless. These can be tapped as plugins with Luminar 2018 to keep the workflow simple. Unfortunately, even though Luminar is cross platform, the older Macphun apps only work with mac OS. They are available on the Skylum site. Here's how it works. 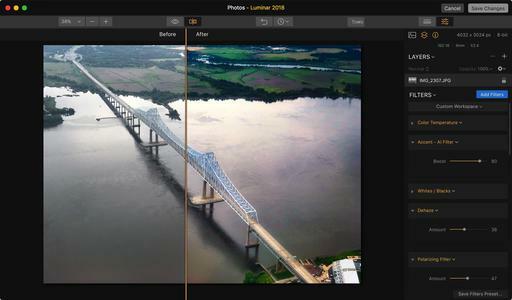 Step 1 - With the image open in Luminar, go to the Plugins menu and choose the one you want. (You have to have these already purchased and loaded on your computer.) In this case, I'm going with the B&W editor, Tonality. Step 2 - In Tonality, I make my edits. Once I'm finished, I click on Apply to return to Luminar. Step 3 -Back in Luminar, all of my options are open. The Tonality-edited image appears on a separate layer. I can adjust its opacity or use a blending mode. Step 4 - On the Tonality layer, I used the Luminosity blending mode to create the look I wanted. Step 5 - Next, I tapped the Noiseless plugin to help me control the noise that was visible in the sky. Same process as before. It also returns on its own layer. Step 6 - I save the the image as a Luminar file (.lmnr) by using the Save command. I can then export the image in any format or file size for sharing. I published the finished image on Flickr for sharing and enjoyment. Compare it to the original shot illustrated in Step 1. 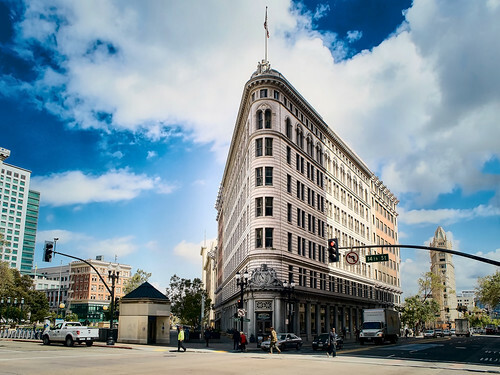 There is a big difference in the rendering of the building. I used plenty of native Luminar tools as well, such as Erase and the Accent-AI filter. But having access to some of my favorite Macphun apps, especially Tonality and Noiseless, makes for a powerful, creative work environment. We were up well before dawn to cover the annual Sonoma County Hot Air Balloon Classic in Windsor, CA. This was the perfect assignment for my Olympus M.Zuiko Digital ED 17mm f/1.2 PRO lens mounted on the OM-D E-M1 Mark II. Even in the dimmest of lighting conditions, I was able to keep my ISO low and the resolving power high. "Firing Up the Balloon" - Olympus OM-D E-M1 Mark II with 17mm f/1.2 PRO lens. ISO 200, f/1.2, 1/200th, -0.7 EV, RAW. Photo by Derrick Story. For the entire shoot, starting at 5 AM and continuing to 7:30 AM, I locked the aperture at f/1.2 and used auto ISO. The camera keep my ISO very low, usually at 200, yet I still had plenty of shutter speed to freeze the action. The excellent sensor-based image stabilization in the E-M1 also helped my cause. The RAW files from the shoot had excellent sharpness and tone. I was able to focus quickly on the main subjects and let everything else sort itself out. You would think that I would have many mis-focused shots at such a wide aperture, but those were rare. On occasion, I would switch to the 45mm f/1.2 PRO, but it and the 17mm were the only two optics that I used for the shoot. Never before has challenging lighting been such a joy.